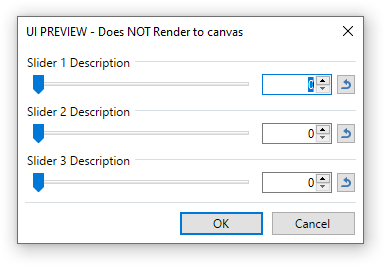 Before Paint.NET calls your Render function, it preloads the Amount1, Amount2,... AmountX variables with the current control settings that have been adjusted by the user. Typically, in the Render function that you write, you simply need to use the AmountX variables and they will contain the appropriate data. When the Render function starts, the Amount1 integer variable contains the number entered by the user. When the Render function starts, the Amount1 boolean variable contains true if the check box is checked and false if it is clear. When the Render function starts, the Amount1 ColorBgra variable contains the selected color. The default color for this control is taken from the current primary color as specified in the color docker window. If two color wheels are included in your UI, the second color wheel will default to the secondary color as specified in the color docker window. Also, note that you can access the R, G, B, and A elements of the Amount1 color individually by using Amount1.R, Amount1.G, Amount1.B, or Amount1.A since Amount1 is a ColorBgra variable type. When the Render function starts, the Amount1 double variable contains a decimal value from -180.0 to 180.0 with a default of 45.0. This one is a little more complicated to use. When the Render function starts, the Amount1 structure contains two double variables, one for each slider. Each "double" variable has a range of -1.0 to +1.0 where -1.0 represents the left (or top) of the canvas, 0 represents the center, and +1.0 represents the right (or bottom) of the canvas. // where 0 is the left/top and 1 is the right/bottom. When the Render function starts, the Amount1 double variable contains the value entered by the user. This works exactly the same as the integer slider, except that in this case the value returned is of the double type. In this example, "Fill with" becomes the drop-down box label, "Primary Color" becomes the first option (Amount1=0), and "Secondary Color" becomes the second option (Amount1=1). Here, the Amount1.Apply function takes two parameters. The first parameter is the "left hand side" of the blend and the second parameter is the "right hand side". The user selects the actual blend method from your effect's user interface. You need to think about how your result pixel will look. Switching the order of the supplied parameters makes a big difference. When the Render function starts, the Amount1 string variable contains the string value entered by the user. When the Render function starts, the Amount1 FontFamily variable contains the selected font family. Notice in this example, we need to reset the dst canvas with the src canvas BEFORE we write our strings to the dst canvas. This is because writing strings does not write to every single pixel on the dst canvas. And, this is something that we need to be sure to do! So, before we write the strings we copy the entire src canvas to the dst canvas. In this example, "Delete" becomes the list label, "White" becomes the first option (Amount1=0), and "Black" becomes the second option (Amount1=1). In this example, you pretty much ignore Amount2 as it is only there for housekeeping. The real work is done behind the sceens where the RandomNumber is setup for you and seeded using the Amount2 variable. You juse need to use RandomNumber.Next(n) or RandomNumber.Next(m,n) to get a series of random numbers. * Each time your effect runs, it will give the same series of random numbers unless the user presses the Reseed button (then a new list is generated). The reason behind this is simple, you want a consistant view if the user is adjusting another control (like the color wheel in this example). *Random numbers are returned in the range of (0 < random number < n) or (m < random number < n) so calling RandomNumber(256) will return a random number between 0 and 255, inclusive.